Pacific Sensor Technologies announces the introduction of the BinMaster Guided Wave Radar (GWR-100) level sensor for measuring powders, bulk solids and liquids in vessels up to 78 feet tall. 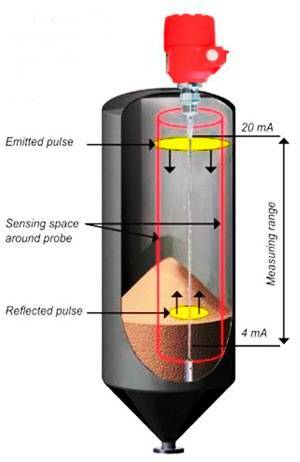 The Pacific Sensor Technologies GWR-100 Guided Wave Radar Level Sensor,uses time domain reflectometry (TDR) to continuously measure the distance, level and volume of material contained in bins, tanks and silos. It performs reliably and is immune to dust, humidity, temperature, pressure and bulk density changes as well as noise that might be present when filling or emptying the vessel. The Pacific Sensor technologies GWR-1000 Guided Wave Radar Level Sensor features advanced two-wire TDR measurement technology with a low dead band (hysteresis) and accuracy of ±0.2 inches (5 mm). The measurement data is converted to a 4-20 mA output with HART communication and can be viewed via a graphical display on the device or an optional local display using the SAP-300 plug-in display unit. Pacific Sensor technologies’ offers standard models for process temperatures from 22 degrees below zero to 195 degrees Fahrenheit (30 degrees below zero to 90 degrees Celsius) and high temperature models for temperature extremes from 22 degrees below zero to 392 Fahrenheit (30 degrees below zero to 200 degrees Celsius). An 8-mm cable with a 1.5-inch NPT is offered for use in liquids and heavier bulk solid materials and a 4-mm cable with a 1-inch NPT can be used in lighter powders and bulk solids. Technologies will be in touch as soon as possible.